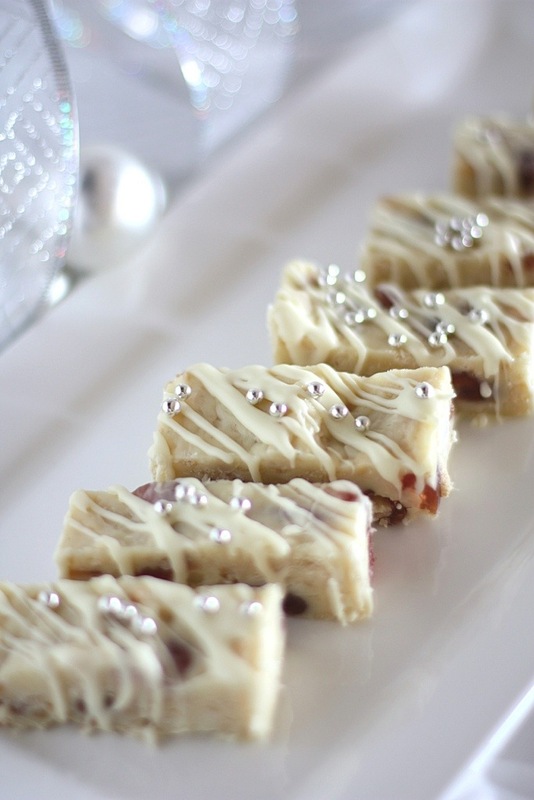 If you love white chocolate then White Christmas is the perfect confection for you! White Christmas is rich, sweet and packed with your favourite nuts and fruit. This batch of White Christmas was made for my mother-in-law. She was given some treats by her neighbours for Diwali and thought it would be a nice gesture to return the favour at Christmas time with one of her seasonal favourites. However my mother-in-law is not a keen cook and her enthusiasm for the task waned as Christmas neared. So I happily offered to make it for her. And why wouldn’t I – it’s an opportunity to win favour with very little effort. White Christmas is very easy to make and one that you can adjust to your own taste by changing the nuts or fruit. 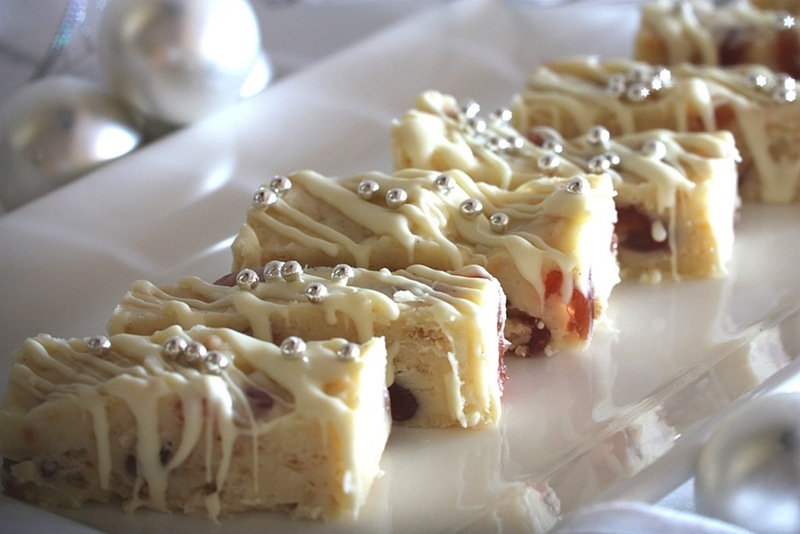 The recipe below has been adapted from Jo’s White Christmas recipe. My only innovation has been to add a can of condensed milk for a more fudge-like experience. Next year I will add slightly more nuts and fruit, and maybe play around with the flavours; perhaps pistachios and cranberries or even a rum and raisin. What is your favourite Christmas sweet? Line the base of a 20x30cm (8x12inch) pan with baking paper. Cut the glace cherries in half. Toast the almonds in a dry frypan. Place these ingredients in a large bowl with the coconut and rice bubbles and set aside. Put the white chocolate in a heatproof bowl and place this over a saucepan with a small amount of simmering water. It’s important that the bottom of the bowl doesn’t touch the water. When the chocolate has melted add the vanilla and condensed milk and stir until smooth. Fold through the dry ingredients. Pour the mixture into the prepared tin and smooth the surface with a spatula. Place in the fridge to set. When you are ready to decorate, remove from the tin and cut into small pieces. Heating the knife first will make cutting easier (I did this by filling a large pilsner glass with hottish tap water, dipping the knife in then wiping it dry with paper towel). Place the cut pieces on a wire cooling rack. 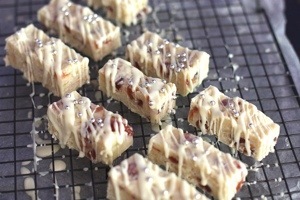 Melt the white chocolate and drizzle over the top. Sprinkle over the cachous. Best stored in the fridge. Posted in Sweet TreatsTagged Christmas, Diwali, food, food photography, mother-in-law, vegetarian, white chocolateBookmark the permalink. Thank you very much Christine. I hope you had a good Christmas! Lovely, adorable photos 🙂 Great recipe. Thank you !